Getting a roof repaired is something most DFW property owners dread, but every roof will need repairs at some point in time, especially when nature's elements work to slowly (or sometimes suddenly) degrade the roofing materials. When the roof does need repair, it is important to get not only the right shingles that match your current shingles, but the best quality workmanship on the installation as well. Most of us will start the process by getting an estimate for roofing repairs from a few choice roofing companies like DFW Best Roofing. DFW Best Roofing has grown to become one of the most well known facets of our business. We take tremendous pride in our reputation as one the best roof repair contractors in our industry. By offering excellent, first-rate customer support, our customers can be confident they will be well taken care of. When a storm has caused your roof to suffer, you've little time to mess around finding the right roofing contractor to take care of the repairs. You need someone who can give you quality repairs that you can trust right away. Count on our experts at DFW Best Roofing, and you'll have quick and efficient professional repairs done by our expert roofing contractors. When you need help now due to storm damage, call our professional roofers! Hail usually causes damage to roof structures even if the roof is in good shape. The older the shingles get, the more damage is done over time where eventually your shingles will crack even if they're made of flexible asphalt. While some roof systems stand up better to hail damage, like the metal roof, damages can still be a problem you'll need to address. No matter the type of roof damages you have or type of roof repairs you need, our professional roofers are standing by to help you. Don't attempt to make the roofing repairs on your own, putting yourself and your family in danger, call on our professionals and we'll come out right away to help you make temporary repairs until the storms pass. For the few times in Texas it does snow, your roof structure takes the brunt of the pressure when ice and snowfall in our heavy snowfall region of the country. Heavy snow loads can cause major problems including roof cave ins. If your roof is damaged by snowfall or ice that builds up and won't slide off the roof as it should, you'll need help with the problems caused. It takes a an immediate response for damages like this because the roof can no longer keep out moisture, and snow weighing down your roof is a serious risk for the occupants safety in the home. Our experts can locate any damage you may have from ice and snow and give you an estimate for the repairs. Don't wait to have these issues assessed by our professional roofers, call now. Do you have a leaky roof? 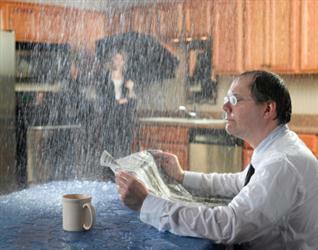 Don't let a small roof leak turn into a bigger adn more expensive roof repair problem. Call DFW Best Roofing to repair your leaking roof and fix your roof drainage problems. Our friendly and knowledgeable crew at DFW Best Roofing will work with you to ensure your roof is repaired quickly and properly. DFW Best Roofing performs roof repairs for a veriety of roof types. Do you have curling roof shingles, damaged slate, or cracked roof tiles, or a hole in your roof because of a leak? Do you need a flat roof repaired? Whether it's repairing a shingle roof, fixing flat roof leaks or repairing roof tiles, our experienced crews will fix and restore your roof promtply to help defend your property once again from the elements. We can match any material. Do not hesitate to call DFW Best Roofing at 817 381 6855817 381 6855 once you see the first sign of a leak or stain on your ceiling or roof. You have our commitment to top quality customer service and a guarantee that we will repair your roof to your utmost satisfaction and at a fair price. Find out today how DFW Best Roofing can fix your roof.